The U.S. is muddling through its worst recession since the great recession, but there are still plenty of car buyers around who are prospering in this economy — and willing to dig into their deep pockets for luxurious sports cars. That’s why Mercedes-Benz recently unveiled a quartet of 2011 CL-Class speedsters aimed at buyers with family incomes of $600,000 to $1 million annually. Bart Herring, product manager for these CL models, says Mercedes is assured that there are buyers who desire such elegant sports cars. Prices range from about $120,000 to about $213,000 for the new 2011 speedsters. The new speedy quartet boast new powerplants that generate more horsepower yet yield more miles per gallon than their predecessors. 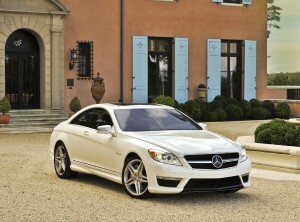 The 2011 Mercedes CL550 has a new 429-horsepower twin-turbo V8. The 4.6-liter direct injection gasoline engine produces 12 percent more horsepower than its predecessor, and 516 lb.-ft. of torque. Buyers get the extra power and a bonus of 10 percent better fuel economy. In addition, the CL550 has a seven-speed automatic transmission and 4Matic all-wheel-drive. With its powertrain, the CL550 has no trouble achieving its electronically limited top speed of 130 mph; of course that’s not designed for U.S. buyers, but for German customers who drive the Autobahns that have no speed limits. An AMG version of the CL-Class has a top speed of 155 mph that’s also electronically limited. If that’s not enough, Mercedes offers a speed package that can jet you to 186 mph, thanks to tires designed to withstand heat buildup at such high speeds. I had an opportunity recently to drive the CL550 on roads in New York’s Hudson Valley. Needless to say, I didn’t attempt to reach the higher speeds the car can reach. But it’s a powerful vehicle that comfortably cruises at legal speed limits on country roads, and it can reach back and help you speed up quickly for passing on an Interstate. The 2011 CL550 is also equipped with the latest electronic systems, such as blind spot detection and lane-departure prevention. I experienced the latter for the first time in a production car and it is very insistent on keeping you in lane. Any slight deviation toward either side of the lane while driving results in quite an aggressive yanking you back toward the center. It’s actually a little unnerving until you get the hang of how the system works. It also helps keep you focused on steering straight ahead and not wandering to either side of the road.